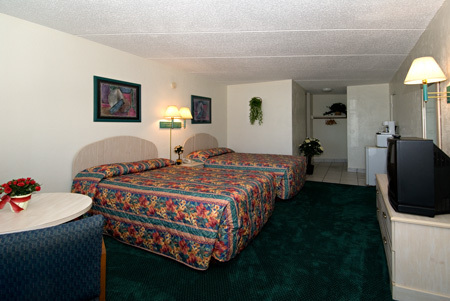 "My husband and I stayed at your motel just this past two nights and we love it! We definitely want to hear about your specials and we will be back!! Thank You"
Max Occupancy: 4 Large ocean view room with 2 double beds, small refrigerator and microwave, and sitting area. Clean and comfortable! Rooms include TV, Free Wi-Fi and one free parking spot per room.